Des Moines, Iowa – The Iowa Barnstormers today announced that WR/DB Tim Dodge, a seven-year arena veteran and all-league performer, has retired from arena football to pursue a career in law enforcement with the Ankeny Police Department. Dodge, a native of Rockwell, Iowa was a two-sport standout at the University of Iowa in football and track, where he earned all-American honors. 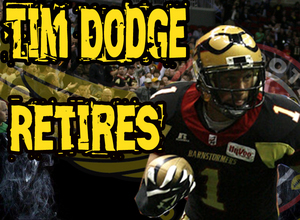 His retirement from the Barnstormers active roster is effective immediately. Lamberti indicated the team is planning to formally honor Dodge’s career at the July 16 game against Spokane and that the team will announce specific details in the coming weeks. In his seven-year career, Dodge was a throwback to the roots of “Ironman-style” arena football as he played wide receiver, defensive back and was often his team’s primary kicker returner. As a receiver, Dodge finishes his career with 610 receptions, 7,670 yards, and 126 touchdowns. Dodge posted career-best numbers during the 2004 season as a member of the af2 Quad Cities Steamwheelers, earning the league’s 2004 Ironman of the Year award after recording 108 catches for 1,596 yards. Dodge’s stellar 2004 campaign saw him earn an invitation for a tryout with the National Football League’s Carolina Panthers. Dodge also earned accolades during the Barnstormers’ 2009 campaign, as he was selected all-af2 second team after leading Iowa in all-purpose yards, including seven kick returns for touchdowns. The Barnstormers (3-4) return home Saturday, June 5 to play the Alabama Vipers (4-4) at 7:05 p.m. at Wellmark Field at Wells Fargo Arena. Tickets are on-sale at www.theiowabarnstormers.com or (515) 633-2255.